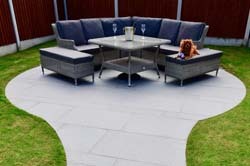 GWH are leading designers of patios which become the focal point of your garden. They can be a quite place to sit and read, a family area, an entertaining space, or just a spot from which to enjoy the rest of the garden. We can offer the client a large variety of materials which can be laid in an unlimited number of designs, the only limitation is imagination. Mixing materials can also provide a stunning patio design, such as paving setts with cobble detail or granite with marble. At GWH, we will help you decide on the best materials and design for your budget and lifestyle. We will manage the whole patio project from initial idea to completion, including, design, engineering, installation, electrics and any other relevant hard landscaping such as retaining walls or steps. To help you make the right choice for your home and lifestyle, we have put together a collection of our favourite patios for you to have a look through to get inspired. 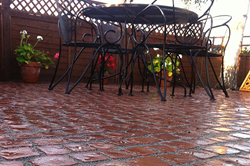 For more guidance of choosing your new patio design, give us a call and we will be happy to help. The latest projects at the top of the page are of work carried out up to the end of 2016. We add new images of our work on a regular basis, so check back soon to see more of our work. Click on any image to launch the slideshow.